Get the Cardmunch iPhone app now! Millions of business cards are exchanged everyday, and CardMunch is at the heart of solving this age-old problem. In fact, millions of business cards have been digitized on CardMunch to date. By using the new CardMunch app, you now have access to deeper and richer information about the person behind the card -- via the LinkedIn profile -- who you know in common, where they’ve worked, where they went to school, and much, much more! For the first time, we’ll be connecting the physical world of business cards with the digital world of LinkedIn profiles, and helping millions of professionals everywhere take the world of contacts and phone numbers into the future of professional networking. We’ve also done a major re-haul of the CardMunch experience with particular focus on how we can make outbound professionals more successful and productive. As LinkedIn Mobile has grown 400% year-over-year in page views, we are continuously looking for ways to bring value to professionals and we’ve done this with the new CardMunch app. 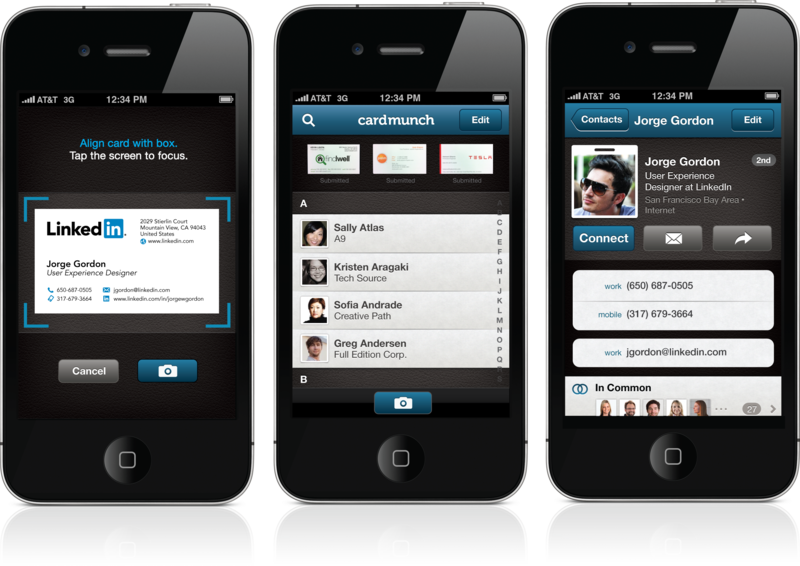 The new CardMunch application introduces a brand-new and stunning visual experience. Additionally, our completely re-designed camera experience allows users to capture cards faster than ever. We've reduced the entire application to 3 super intuitive and easy to use screens: (1) Card capture (2) Contact list (3) Contact details and LinkedIn profiles. Past versions of our app only showed you the information gleaned from the business card you scanned but with this version we wanted to bring to our members the richness of profile information that only a site like LinkedIn possess. Once you scan your card, we’ll map that information with their LinkedIn profile, along with photos of contacts, common connections, past work experience, education. Now you know the person behind the card - the who, what, where and when for every business card you scan. Finally, since CardMunch is used by professionals - both outbound professionals to the newbie attending her first conference - we’ve taken special pains to include some powerful functionality that’ll help any member. You can still add contacts to your iPhone address book, connect with contacts on LinkedIn, view your mobile rolodex of cards, and much more! Add notes on-the-go while waiting for your card to be processed by our team. We’re thrilled with this current iteration that expands on the original app by adding features our members had asked for. We look forward to your feedback as we continue to focus on building on these improvements, so stay tuned for newer and more exciting features in the versions to come. Let us know what you think by joining our LinkedIn group for members using our mobile apps. Or, leave a comment or @linkedin us on Twitter.